When you’re at the corner of West 6th Street and West Avenue in downtown Austin, make sure you look up! You don’t want to miss this rooftop hideaway. Green Light Social is a cocktail bar overlooking Austin’s West 6th entertainment district. Walk in through the black gates and up the stairway to discover why we adore this venue! Designed to hold weekend crowds, Green Light Social’s layout suits 40-250 guests. Rentals can be semi-private for smaller parties or completely private with a venue buyout. Book the rooftop patio for stunning views of the city! Inside, folks gather ‘round the bar to experience imaginative cocktails like the infamous ‘Main Squeeze:’ a vodka-infused juice pouch. No time to book a caterer? What about entertainment? 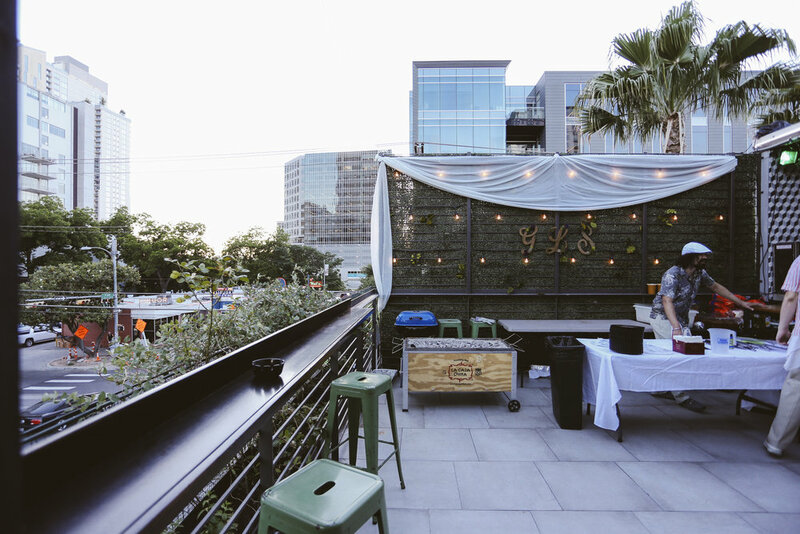 Get access to an array of local favorites with full-service booking through Austin Venue Collective! Take advantage of the indoor stage where local DJs can mix beats for dance parties and entrepreneurs can give company presentations. Before the party is over, capture the moment at the My Event is the Bomb photo booth! With amazing lighting, custom graphics, and the ability to share directly on social media, your evening won't be forgotten! Want to really impress your guests? Book the private speakeasy, Benny’s Room, located inside Green Light Social. It’s usually members-only, but the secret is, you can book events for up to 40 people! What are you waiting for? Host your next fundraiser, bachelorette, or giant bash at Green Light Social!